A trip in the old town of Lecce (also called Firenze(Florence) of the South, thanks to the beauty of its architecture) to discover why was it included by the Lonely Planet in the list of the first 10 cities to visit. 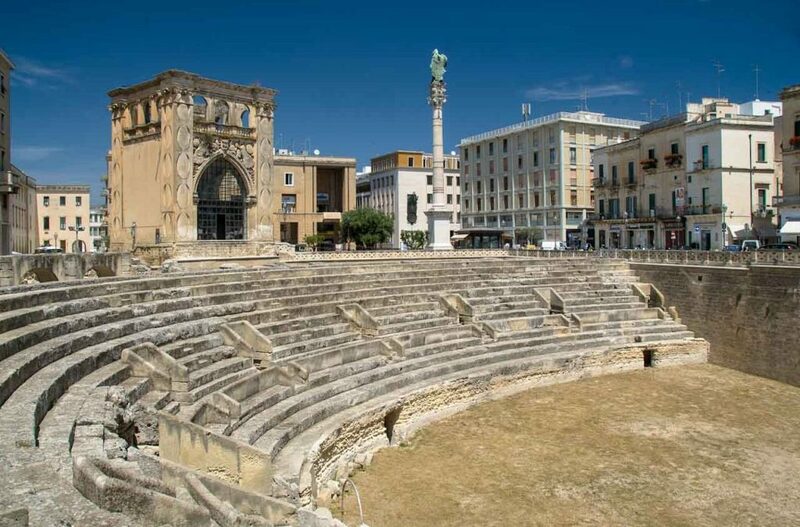 The guided tour is an itinerary trough Lecce’s history and symbols (churches, monastery, palaces, plaza’s and castles); since the ancient Roma (when was named Lupiae) until the Baroque period.The city tour includes the most important monuments: Piazza Sant’Oronzo, Anfiteatro Romano, Teatro romano, Palazzo Celestini, Basilica di Santa Croce with the wonderful baroque façade and the fascinating Piazza Duomo(one of the few “closed” plaza’s in Italy), palaces (Carafe, Adorno, Marrese, Palmieri-Guarini, etc. ), the Carlo V Castle and some interesting churches(S. Irene, S. Matteo, S. Chiara, the Greca, etc.) and the antique gate of the city ( Rudiae, Napoli, S. Biagio). During the tour is possible to stop and visit some craftsman laboratories (they craft object out of papier-màchè) and/or tasting a typical snack (a salted potpie, pastries (pasticciotto wich has a crème filling), a gelato) or a cup of coffee in a small artisanal coffee factory. We can stop for a meal in local restaurant, a cooking lesson, wine tasting, cheese and other dairy products tasting, and many other local products. We can visit the church of San Niccolò e Cataldo: an amazing example of Salento medieval architecture. On the outskirts (the vineyards of Salice Salentino and Guagnano, Galatina also known as the Assisi of the South, the castle of Corigliano, Nardo and the amazing old town, wine and olive oil and last but not least the cliffs of the natural park of Porto Selvaggio, the UNESCO site of Otranto, the dolmen and menhir area, Gallipoli, Brindisi (the gateway to the East), Mesagne with the Swabian Castle.